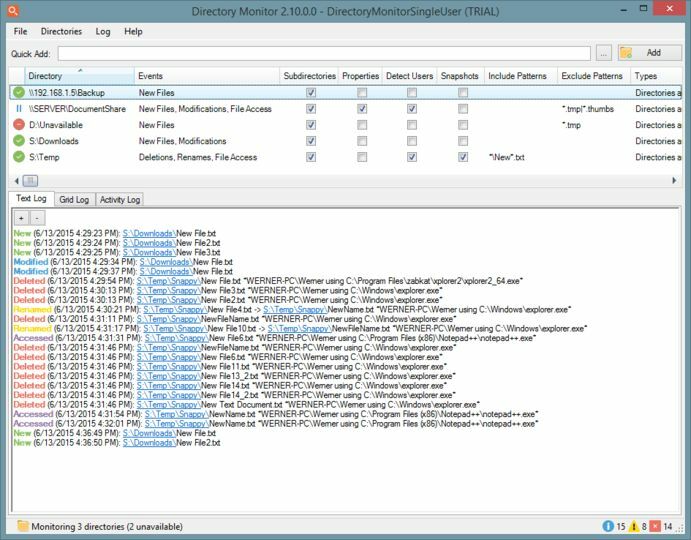 Directory Monitor is an excellent tool that will monitor specified directories and make logs of any changes, file deletions or so on. It will make its logs in real-time and even gives you the option to execute a certain application when a specified change occurs. Monitor directories for file changes, modifications, deletions and new files in real-time. Monitor local directories or network shares (including hidden shares). Run as a Windows service. Optionally execute an application when an event occurs. Log the user on the network that made the changes. Include/exclude filtering on files being monitored. Quickly tell if a directory is available and being monitored. Balloon notifications whenever an event is fired. Auto updating, import/export and more. This application requires .NET Framework 4.0 (automatically installed). NOTE: This portable version of Director Monitor does not require an installation.